Mynah birds with size sixteen feet thumping about on the roof awakened us. The roof is tin and carries sound quite fervently. Breakfast was a repeat of the previous day and we headed out equipped with warm jackets and gloves. Our first stop was the lava flow from 1984. This was at the end of a five mile very bumpy run of what might be described as an off-road pathway. The understory was quite dense in parts, feral pigs roaming about in the underbrush. The lava flow was coarse and bumpy but covered with an incredibly soft leathery gray lichen coating. There were patches of ferns here and there; some bright pink smart weed and in the distance I could hear birds in the forest. Lava is quite fertile and with the amount of rain here, new soil is quickly formed. Our next stop was driving through the sides of Mauna Loa up to the telescope area. Mulleins, a common weed in Wisconsin were spaced along the roadside looking rather like planned sculptures. The lava varied in color from deep rusty red (from it’s iron content) to dark black to gray to brownish. The texture also varied from smooth to very hard to spongy to looking like an experiment making fudge gone wrong with ripples and caked areas. Part of the area underwent an Ice Age and that was still a different texture. We arrived at the telescope visitor center, bought a sticker admonishing us to be wary of the invisible cows ( free range cattle, dense fog, and unsuspecting tourists are not a good mix), and then proceeded to the actual living quarters/dining area of the telescope workers. As guests of my brother-in-law, we were invited to a lunch of kimshee burgers and spinach soup. Our next stop—the telescopes. It is hard to imagine snow in Hawaii or being cold or being in the middle of an ice-hail-sleet storm—but there we were. 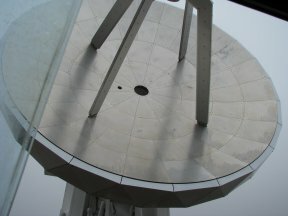 The telescopes are huge and impressive; all the parts being trucked up a 17% grade to 14000 feet. Day and night crews work the telescopes, the mirrors are resurfaced, counterweights applied to balance new pieces of equipment—-and then after supper we watched a video of time-lapse photography shot of the things seen through the telescopes and the telescopes themselves. After a significant amount of hail ran down the back of my polar fleece, we climbed back into the car and drove back across the saddle to Kona. The land here is ranch land dotted with cattle pens; the other side of the island is Kona—home of Kona coffee. Coffee plantations are small, on the hill-sides, and require a great deal of hand labor as each bean must be individually picked and they do not all ripen at the same time. A bit further down there were huge groves of macadamia trees. It was getting quite dark and so we decided to skip South Point and head home. Supper was pizza, salad with avocado, and something that looked like strawberries with whiskers—but were like lichees—you peeled off the bright red exterior to reveal the pale white shiny peeled grape like interior around a single seed.